Girls hair accessories are almost like Lego pieces in our house!! I am regularly finding a hair lackey or two lying on the floor somewhere. As Mums of girls would know, head bands, clips, ties and other pretty accessories can quickly become a big mess! Since I am teaching my kids the principle, “everything has a place and everything is in its place”, I thought I would share some cute and practical storage ideas to organise girls’ hair accessories. Organise your girls hair accessories by type and/or colour in inexpensive plastic containers, which make better use of the space in a drawer. Organise girls’ hair accessories with an ice block tray. Super cheap, even shop the house for one and brilliant for organizing lots of different types of clips. Glass storage jars are great idea to organize girls hair accessories and they also make a pretty display. Make sure they are off limits for little ones though as a safety precaution. This is what my daughter has to organize her hair accessories which get kept in a drawer in her bedroom. It works well because it is easy to see what you need at a glance and more importantly, helps with putting things back. Alternatively use a small set of stationary or craft desk top drawers to keep everything organized. Have lots of tiny hair bands? Re-use an old pill box to organize them all. Another way of organising hair ties or lackeys is to use a carabiner clip or even shower curtain rings. Looking for cute girls hair bobbles or little girls hair ties? Go DIY with some lengths of wood or even a couple of recycled pallet pieces. Attach some sparkly pegs to it to hang all your daughter’s pretty head bands or ties. Alternatively use an old picture frame, remove the glass and glue a decorative piece of paper or fabric to the back. Paint the frame in a colour you like. Then attach ribbon or string to the frame to provide a way for pretty bows and clips to be organised. Include hooks or decorative knobs at the bottom of your frame for extra storage! Go vertical or horizontal with your display. Alternatively attach lace or ribbon to a fabric covered pin up board and away you go! Even use a separate piece of wood to organise girls’ hair accessories. Cover it with a pretty fabric to tie in with the look of your display frame. Attach several small hooks to your wood piece and organize hair ties by colour. For display, as well as storage, that doesn’t involve hanging anything, try something like these pretty tiered metal baskets. A really cute way of displaying hair accessories would be to decorate a MDF letter for the first letter of your daughter’s name. Then attach ribbon or other material to it for a cute organization solution. This would be a great idea in a nursery where Mum is the one accessing the hair items. 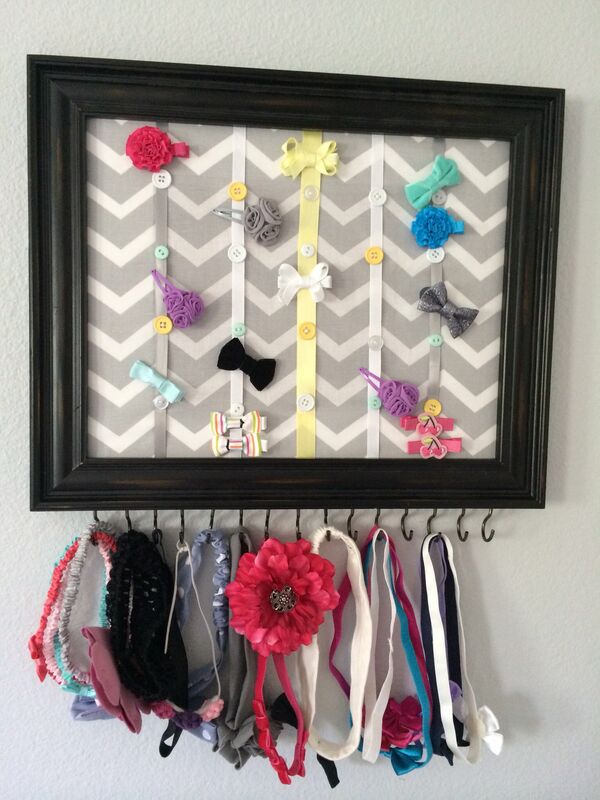 Well there you have it… 15 adorable ideas for organizing and displaying girls pretty hair accessories. If you are wanting something pretty but not keep on DIYing it, consider these handmade hair accessory organizers available on Etsy.